You've heard of software as a service (SaaS), but fish-as-a-service (FaaS)? Probably not. That name, and the acronym, are the subjects of two recent federal trademark applications. 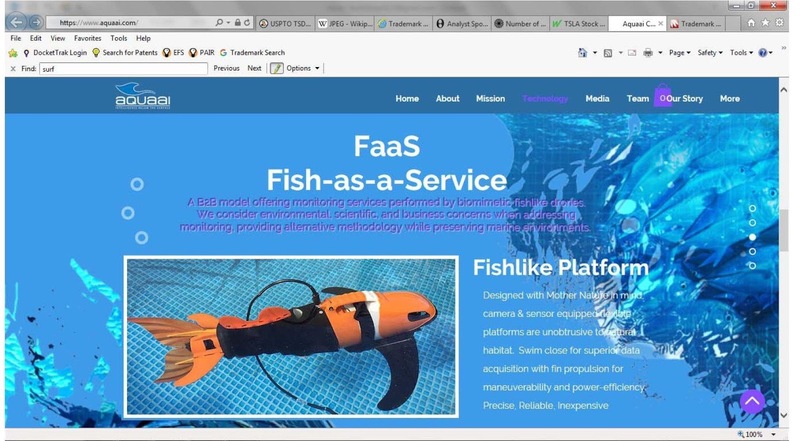 On May 2nd, a California partnership called Aquaai Corporation filed the FISH-AS-A-SERVICE and FAAS trademark applications with the U.S. Patent and Trademark Office. Both applications cover the "rental of underwater drones" in Class 41 and indicate the trademarks have been in use since April 18, 2018. According to Aquaai's website and the specimen submitted with the trademark applications (seen above), the company rents biometric fishlike drones to collect data underwater. The company's mission is to "save the seas by providing intelligence under the surface." What happens to the trademark applications next? In about three months, the applications will be assigned in an examining attorney at the USPTO, who will review the application to make sure it meets all the statutory requirements for registration. See TMEP 704.01; 37 CFR 2.61(a). If there are any issues, the examining attorney will notify the applicant, who will be given six months to respond. TMEP 705 et seq. For example, a refusal to register the mark will be made is a confusingly similar trademark is already on file with the USPTO. TMEP 1207; 15 USC 1052(d). If the applications make it through the examination process, or any issues raised during the examination process are resolved, the application will be published for thirty days in the USPTO's Official Gazette. TMEP 1502; 15 USC 1062. During that time period, any third party that believes it would be damaged by the registration of the trademark is entitled to oppose its registration. If an opposition is filed, it triggers a lawsuit-like proceeding in front of the Trademark Trial and Appeal Board. TMEP 1503.01 et seq. If no opposition is filed, the applications should mature into registrations about eleven weeks after the initial publication date. In total, a trademark application without any issues in the examination phase takes about nine to twelve months to register.